Fitzgerald Sale "Bud" Parker Jr. The Tennessee delayed birth certificate of Pamela Parker's father Fitzgerald Parker gives her birthdate as 19 MAY 1938. This disagrees with other public records. 1 Federal Census, TN, Davidson County, 1940, Civil Dist. 7, E.D. 19-26B, Sheet 31A, Image 61 of 80, Ancestry.com (Online Census Images). 2 Tennessee, Delayed Birth Records, 1869-1909, Delayed Birth Certificate for father Fitzgerald Sale Parker, Ancestry.com (Online Database). 3 The Atlanta Journal-Constitution (Atlanta, Georgia), 28 JAN 2013, Article about spouse John A. Helms, GenealogyBank.com. 4 The Atlanta Journal-Constitution (Atlanta, Georgia), 26 JAN 2013, Obituary for spouse John A Helms, GenealogyBank.com. 5 U.S. Public Records Index, 1950-1993, Volume 1, Public record for Pamela P Helms, Ancestry.com (Online Database). 6 U.S., School Yearbooks, 1880-2012, 1956, Harpeth Hall School Yearbook, p. 20, Ancestry.com (Online Database). 7 Nashville Bar Association, Memorial Resolution for Fitzgerald S. Parker (17 NOV 1994), (accessed 08/25/2015). 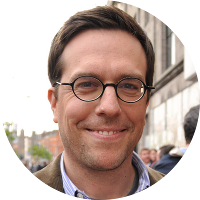 8 Wikipedia, "Ed Helms", (accessed 08/24/2015).